We have reviewed the best Four Seasons hotels in Hawaii, but if you are looking for true escapism on the Hawaiian Islands, look no further than the Four Seasons Lanai. 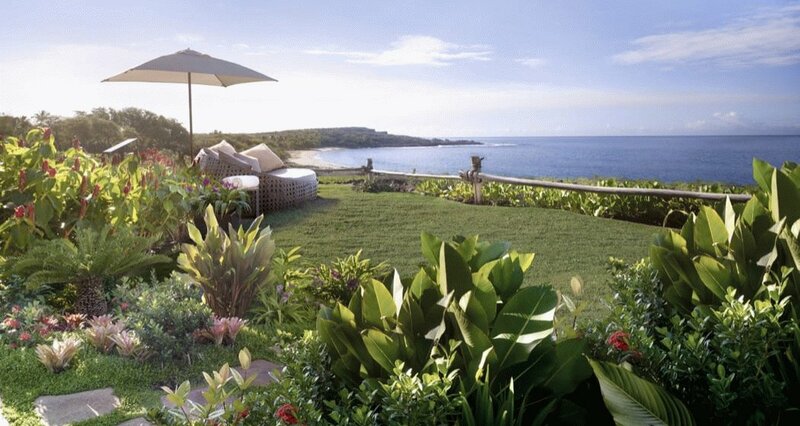 Four Seasons Lanai is the most remote Four Seasons hotel on the Hawaiian Islands. 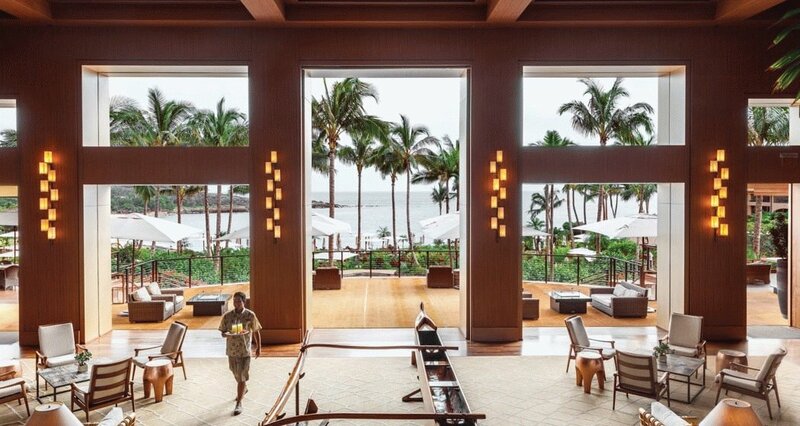 I reviewed the best way to get deals and special offers at Four Seasons Lanai, the key is to book your next Four Seasons stay via our luxury travel concierge and we can give you FREE loyalty-style benefits, room upgrades and perks, at the cheapest rates. This Four Seasons hotel is also the most difficult Four Seasons to get to on the Hawaiian Islands. The Maui and Oahu hotels can be reached by one flight direct from the mainland and then a short transfer. International flights do not fly into the tiny airport in Lanai. Ohana by Hawaiian Airlines offers a number of flights daily from Honolulu International Airport (HNL) to Lanai Airport (LNY). Flights take 20 minutes, after which guests are transferred to the resort by complimentary shared luxury shuttle service. When you fly into the airport, the Four Seasons has it’s own airport lounge, and as you arrive you will be presented with a Lei (girls orchids, boys wooden beads) that I love. The Expeditions passenger ferry offers daily services between Lahaina, Maui and the Manele Small Boat Harbor on Lanai, just a three-minute complimentary drive from the resort. The scenic ferry ride is 45 minutes, and there are five round-trip ferries throughout the day. Reservations at least 24 hours prior to departure are required and can be booked online. Visit in Hawaii’s off-season, when the rates are cheaper along with three for two-night deals being available and the islands are less crowded. Ideally, travel is spring (April to June) and fall (September to November). Winter in Hawaii can be cloudy and wet from December to March but it is a popular time to travel so expensive simply because the rest of the Northern hemisphere is so miserable and cold. As Lanai is one of the driest and sunniest of the Hawaiian islands, making it a great hotel to book, whatever the time of year. Lanai offers a mix of lunar landscapes, mountain forests, red lava coastal cliffs, and miles and miles of empty beaches. Lanai was also known as the Pineapple Island because the island’s pineapple plantations which once produced up to 75% of the world’s pineapples. In 2012, Silicon Valley billionaire Larry Ellison bought a 97% share in the island for $300 million USD and also became owner of the Four Seasons Lanai. As you would expect, this is a Four Seasons hotel so decoration is in tasteful creams and browns, and all the communal areas look out upon the views of Hulopoe Bay. The main lounge, bar, fitness area, eateries and pool, all overlook this beautiful swathe of picture perfect bay. The interiors have teak and zebra wood walls and mahogany laid floors with hand-woven area rugs. Botanical gardens, two lagoon-style pools and cascading waterfalls serve as a beautiful backdrop for outdoor art. Four Seasons Lanai has 213 stunning guest rooms & suites, each with a private lanai, a full-service spa, and two legendary golf courses. It’s sister resort, the Four Seasons Resort Lanai is The Lodge at Koele. 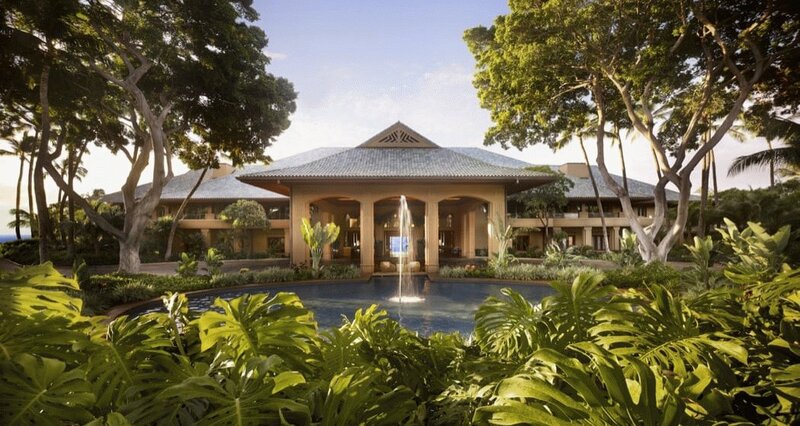 The Four Seasons Lanai has 168 guest rooms and 45 suites reached via open hallways. These newly renovated rooms are lovely and offer an Asian fusion feel with hardwood floors, a mix of browns with creams, and a wonderful and large balcony. The large, zen-like bathroom has teak-panelled walls, and artisan tiles, and features two sinks, a deep soaking bath, seperate shower, and a bidet toilet. The main difference between the rooms is where they are located and therefore their view. 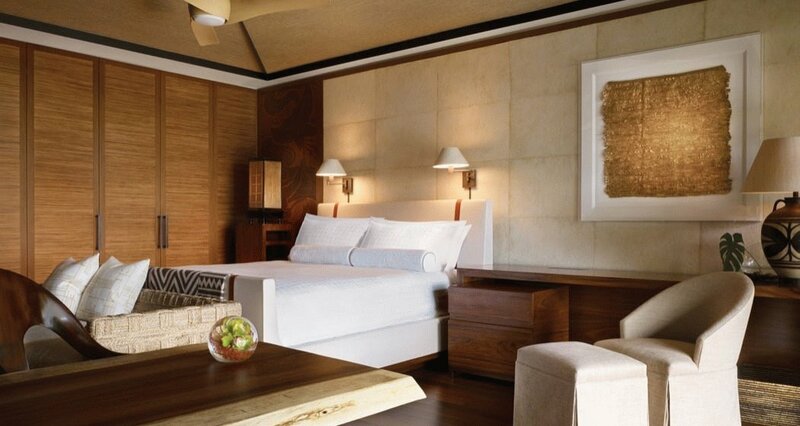 Rooms feature a heavenly king-sized bed, a giant 75-inch LED tv, two desks, a sofa and a private lanai (or balcony). We stayed in a partial ocean view which looked out towards the golf course and some wildland with a glimpse of the sea in the distance. Ocean front rooms are on the front edge of the resort, and some are so close to the sea that you can hear the waves crashing below (request the plumeria wing for this to the left of the resort when facing the sea). If you prefer more panoramic ocean views, then chose the other side of the resort which comes in slightly less expensive. Of course, the Garden View suite at this hotel in Lanai is undoubtedly the best deal as you get to enjoy all the benefits of the resort at the cheapest possible price. The consistent level of quality offered by Four Seasons guarantees you an enjoyable, whatever room you book. The best rooms are those on the Ocean Front (of course!). The two pools are open day and night. A lagoon-style, free-form family pool, comes with whirlpools and is located below the lobby and features a cascading waterfall. An adults-only pool is located in a quiet corner of the resort (the so-called ‘adults-only retreat’). It has amazing waterfalls and lava rock grottos mimicking Lanai’s dramatic cliffs. The beach at the Four Seasons Lanai is spectacular. The resort sits on a red-lava bluff with views over Hulopoe Bay and its pristine beach. This stunning beach is a 5 minute stroll from the hotel’s lobby via meandering pathways. Hulopoe Bay is a protected marine reserve, and while we were there we saw plenty of spinner dolphins jumping about in the water. They can usually be spotted in the summer. In the winter you are likely to spot humpback whales which come quite close to shore. The beach is public (but usually pretty empty except for Four Seasons guests), and the Four Seasons has its own section offering beach services including complimentary use of snorkelling equipment, showers, lounge chairs and towels (from sunrise to sunset). Beyond Hulopoe Bay tide pools (or rock pools as we call them here in England!) can be found at the far end of the beach as well as one of Lanai’s most famous natural landmarks, Puu Pehe or Sweetheart Rock. The resort has four restaurants which aren’t cheap but are very good. 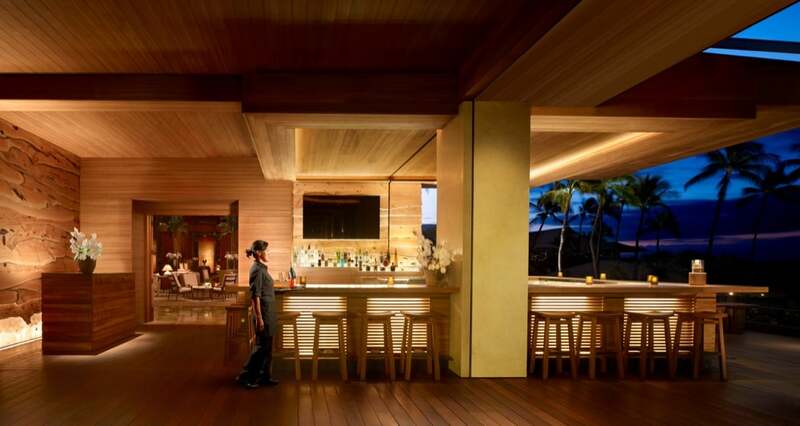 Nobu Lanai is the hotel’s signature restaurant and the first Nobu outpost in the Four Seasons chain. Offering teppanyaki (where food is cooked tableside) as well as an intimate sushi counter, this restaurant serves Japanese-Peruvian cuisine of world-renowned chef Nobu Matsuhisa. Across the lobby is the property’s second all-day dining restaurant, One Forty, which specializes in steak and seafood including prime and Wagyu beef, as well as seasonal Hawaiian fish. On the lobby’s top level, the Sport’s Bar & Grill offers a selection of appetizers, salads, sandwiches, dishes from the grill, and hand-rolled pastas. The Malibu Farm is a poolside outlet which serves delicious organic salads, sandwiches and other plates at lunch. A fantastic breakfast buffet is served at One Forty restaurant from 6 to 11 am. It is undoubtedly the best breakfast buffet on the Hawaiian islands including the usual egg options etc as well as a large selection of Japanese and Korean delicacies, such as tamago (sweet omelet), sushi, sashimi, and black miso cod. The buffet is complemented by an extensive à la carte menu. Don’t expect a great deal of nightlife here. In fact, when we stayed, the alfresco restaurant by the pool, closed quite early. The place to hang out into the night is the beautiful alfresco bar on a large Lanai with sweeping views, connected to the Nobu restaurant which serves a light menu and drinks through to 10.30. After this, you can always wander, barefooted, down to the beach, where you will almost undoubtedly be alone, and you can enjoy a paddle under a milky way of stars. Surely a highlight of this island the Jack Nicklaus-designed golf course is not only Lanai’s premier 18-hole layout but also the only golf course in Hawaii that affords breathtaking ocean views at every hole. The golf course is usually pretty empty and offers an excellent restaurant too. 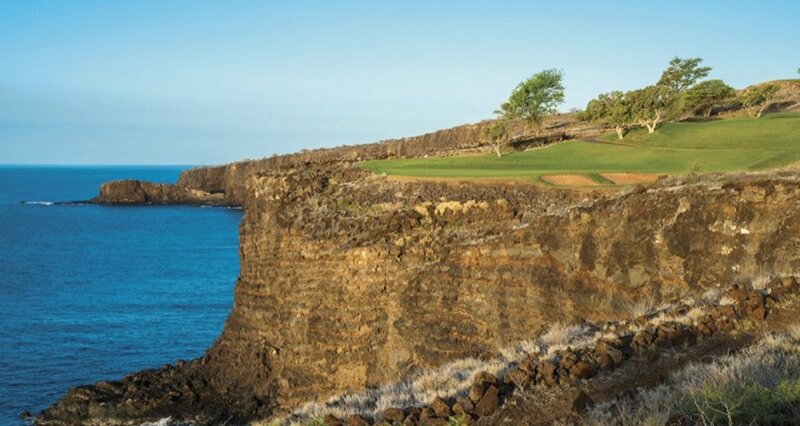 Built on lava outcroppings along the rugged oceanside cliffs, its par-3 12th hole is scenic and considered one of the most beautiful holes in the world; Bill Gates married his wife Melinda here in 1994 (and the Gates couple returned to Lanai in 2015 to celebrate their 20th anniversary). The Hawanawana Spa at Four Seasons Resort Lanai offers treatments inspired by the healing powers of the ocean. The spa features 8 treatment rooms, plus 4 couples’ suites. The spa’s signature treatment is the Ocean Ritual, which incorporates wild seaweed and undaria algae oil. It’s easy to laze your days away by the pool or on the near empty beach which is a 5-minute walk down a slope from the hotel. Golf is also the other way to while the time away here and there are some great inclusive packages. The free Four Seasons shuttle connecting the beach hotel to the mountain lodge (about a 15-minute ride) is also worth making use of as it enables you to take advantage of another golf course, horse riding and more hiking. Further afield you can take a catamaran sunset sail or spend the day off-roading in a 4×4 made for off-the-beaten-path adventure. Most resorts in Hawaii charge a resort fee, even if you are paying on points. Book the Marriott in Wailea and you get your room rate for “free” (on points) but you are still charged an additional resort fee which makes a point booking here quite a bad deal. Unlike the nickel-and-diming resorts across these islands, Four Seasons Lanai does not charge a resort fee. 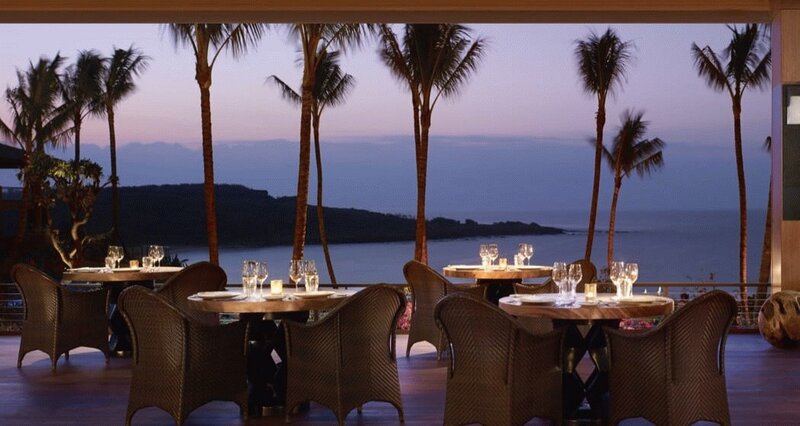 Four Seasons Lanai also features in our best luxury hotels in Hawaii.